Sweetwater Energy is thriving—largely due to the connection it has with the RIT community. Jerry Horton, Sweetwater’s president, says the assistance that Venture Creations gives new businesses is invaluable. About a mile down the road from the RIT campus, tucked away in a nondescript office building—brick, of course—lies a resource that could play a key role in jump-starting the Rochester economy. Venture Creations, RIT’s business incubator, is home to 24 start-up companies. Most were founded by members of the RIT community. All are being enriched by the RIT community. Few understand how valuable those RIT assets can be more than Jerry Horton, president of Sweetwater Energy—one of 10 companies that are part of Venture Creations’ Clean Energy Incubator division. Horton’s original vision was to create an ethanol refinery complex. He discussed his plan with Richard DeMartino, director of RIT’s Simone Center for Innovation and Entrepreneurship, who was concerned that Horton’s plan may be overly ambitious. Together, Horton and the two students realized the true value proposition Horton possessed was in his ability to produce liquid feedstock that could be sold to ethanol producers. Sweetwater Energy, a company that produces fermentable sugars that can be used to make ethanol, jet fuel and bio-chemicals, was formed. “We felt that my background in food processing fit more into producing sugary feedstock than ethanol. 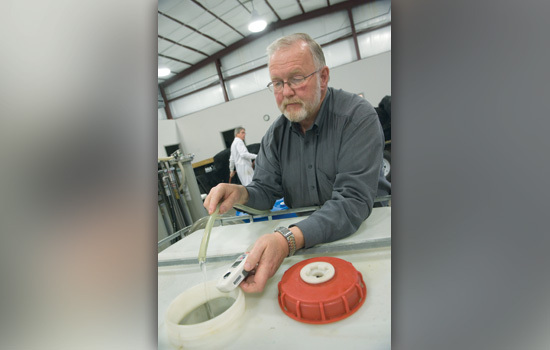 And it significantly reduced the amount of capital I was going to need,” says Horton, who then worked with RIT’s Center for Integrated Manufacturing Studies to develop a manufacturing process. Since then, Sweetwater Energy has grown from two unpaid employees to having 11 employees on the payroll. “And that includes some pretty hefty salaries,” Horton adds. Sweetwater serves as an example of how the knowledge, experience and skill-sets of the RIT community can advance a business, says Jones. That’s one of the primary reasons why Jones is actively recruiting new businesses in the areas of sustainability, imaging, bio-x and software—areas in which RIT possesses tremendous resources and expertise. Jones is implementing a system in which eight of the incubator’s 24 companies “graduate” each year and become independent. That will open the door for eight new businesses to enter Venture Creations annually. Those businesses will be in the later stages of their development, at a point where they already have a prototype built or tested that proves their concept. “We want businesses who are ready to begin pushing commercialization because that directly drives job creation,” Jones says. Preference is given to members of the RIT family, but outsiders like Horton will continue to be sought as well. Every new business, however, will build a strong tie with the RIT campus—whether through RIT research and technology, or student co-ops. Those relationships, coupled with the assistance Jones provides and the informal networking that occurs with other incubator businesses, make the Venture Creations experience invaluable, says Horton. Visit www.rit.edu/research/vc for more information.